The week's top Mac news was the release of Safari 4 Beta, which two members of our staff have already looked at. See Test Driving Safari 4 Beta by Charles Moore and Safari 4 Beta Is Lightning Fast by Simon Royal for two different perspectives on the world's fastest browser. Mac Users Only 7% of Active Firefox Users? Mac Pro a Great Mac or the Greatest Mac? Hitachi GST Expands into External Storage by Acquiring Fabrik, Inc.
"On Mac OS X, Safari was four times faster than Firefox 3 and a depressing (for Opera) 7.5 times faster than Opera 9.6...."
"I've been using my MacBook Pro since a while now and I must say: I really love it. The most common app(s) that designers use has to be Adobe Photoshop (Or the full suite). The app(s) are great, but there is a downside: The price tag. Photoshop CS4 costs $699, CS4 extended is $999 and the full Creative Suite starts at an stunning $1799. For many people this is just a little bit too much to 'play around with'. "Luckily, there are also many free applications out there that can do the same kind of job that Photoshop could do for you. This article rounds up the best 15 free Mac Programs for Graphic Designers. Some of these applications can even do stuff that can't be achieved using Photoshop, or are much more simple to use. "Keep your wallet in your pocket, since all these programs will cost you nothing...."
"The Mac only accounts for roughly 7 percent of active Firefox browser installations. "Sure, Windows has massive market share, but I would have thought more Mac users would be running Firefox than their Windows peers. Meaning, I had assumed that whereas Windows users would be content to let inertia guide them to Internet Explorer (IE), a greater proportion of Mac owners would make the choice for Firefox, instead of Safari that comes preinstalled on the Mac, netting the Mac a greater percentage of active Firefox installations...."
Editor's note: At Low End Mac, more visitors use Firefox than any other browser. The current breakdown is 40.3% for Firefox, 30.6% for Safari, and 20.3% for Internet Explorer. Not surprisingly, the majority of visitors use Macs (50.6%), followed by Windows at 41.1% and Linux at 3.3%. Since hardly any Mac users run IE and Safari's penetration of the Windows world is small, we'll assume all IE users are on Windows and all Safari users are on Macs. That means about 40% of Mac users visit LEM using Firefox, Camino, etc. It also means nearly 50% of Windows users coming to LEM are running Firefox or another Mozilla-based browser - that's about 2-1/2 times the overall Firefox penetration, which we'll guess applies to the Mac as well. Link: Only 7 Percent of Active Firefox Browsers Running on Macs? "Apple has by far the highest level of customer satisfaction among computer-buying consumers, according to a recent study (PDF) conducted by ChangeWave Research. "The study, which focused 'primarily on the US market,' interviewed 3,115 consumers between February 2 and 9. Among consumers who purchased a desktop or laptop in the past 90 days, 81 per cent of Mac buyers reported that they were 'very satisfied' with their purchase. The manufacturer with the next-highest ranking, ASUS, achieved a 67 per cent 'very satisfied' rating. "The news wasn't as good for Dell and HP, which scored 55 and 52 per cent, respectively. Lenovo ranked worst, with a mere 50 per cent of its recent purchasers calling themselves 'very satisfied.'" "Apple may be in for some short-term pain when it comes to the Mac, but it can take comfort in the fact that recent buyers seem very satisfied with their purchases. "Apple customers over the past 90 days reported by far the highest level of satisfaction in ChangeWave's survey, with 81 percent of Apple customers saying they were 'highly satisfied.' Asus customers were the second-most satisfied group, with 67 percent reporting they were highly satisfied with their purchase, while 61 percent of Acer customers fell into that category. Lenovo was last, with only 50 percent reporting such levels of satisfaction...."
"Regardless of whether the Mac mini that has been popping up in pictures and video is the real deal '2009 Edition' or not (my bet: not), a key point many are making to prove it is fake actually makes sense: the two video out ports, one DisplayPort and one mini-DVI. "The mini is intended as a switcher's machine. Just ditch your PC tower and hook the Mac mini up to all your existing peripherals, and you're a Mac user. How much sense would it make, then, to make the only display connector available be Mini DisplayPort, a connection which is not yet part of a greater standard that in and of itself hasn't received widespread adoption...."
"A gallery of screenshots from the latest build of Apple's upcoming Mac OS X 10.6 Snow Leopard operating system showcases a handful of minor design tweaks that have been reported around the web in recent weeks. "The screenshots, published by World of Apple, come from Mac OS X 10.6 build 10A261, which was released to members of Apple's developer connection earlier this month...."
"OS X has a number of options for handling disk images - settings for such things as automatically opening them, moving Internet-enabled images to the trash after opening, verifying checksums, and more. You control all of these options (and a few more) in Disk Utility's preferences panel. "If you change these settings often, though, you may tire of launching Disk Utility and opening its preferences panel. As an alternative - and with a side bonus of gaining one additional option - you can install a hidden System Preferences panel to make accessing these options a bit easier. There are two ways to install this panel; one requires Terminal, and the other uses just the Finder...."
"That's right, kids, I have a day job, and recently that day job changed. I found myself transitioning careers of my own volition (which is saying something in this economy!) and transitioning Macs as a consequence. My previous Mac, a unibody MacBook Pro, was a great machine but it also happened to belong to my previous employer. I needed to plunk down some hard-earned cash and get a Mac of my very own . . . But which Mac should I get?...." Link: My New Mac Pro: Great Mac or the Greatest Mac? 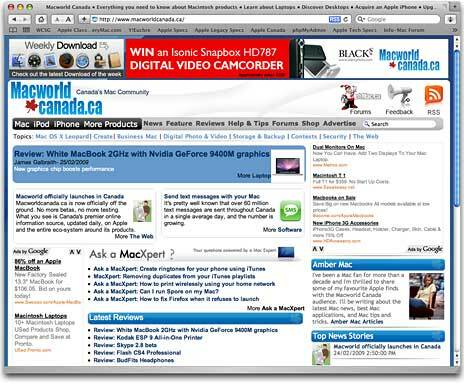 PR: The launch of Macworldcanada.ca offers a unique one stop online information source for Canadian users of Macintosh computers, iPods, iPhones, and everything Apple. The site benefits users from beginner to expert. "Canada's Mac community is passionate about the products they buy and are eager to get the most out of them," says Yasmin Ranade, publisher of Macworldcanada.ca. "With hot tips, news, product reviews, downloads, and compelling features on the latest technologies, it's a place for Mac users to read about, share new ideas and enjoy their equipment to the fullest." Macworldcanada.ca includes ehMac.ca - Canada's largest Mac Community forum. "The integration of the thousands strong ehMac community with Macworldcanada.ca is a natural fit," stated John Strikwerda, ehMac founder and author. "I look forward to continuing my role as the "Mayor" of the community as this new resource reaches out beyond our established fan base." Technology columnist Ted Kritsonis is editor for the site. "As a lifelong Mac user, this new role offers an opportunity to use that experience to serve other dedicated users across the country through a dynamic Web presence," he says. Amber MacArthur, an experienced Web content and usability strategist, technology journalist, and decade long Mac fan, shares her favourite Apple finds, best applications, and tips and tricks with the Macworldcanada.ca audience. Macworldcanada.ca also offers 'Ask a MacXpert,' product comparisons, downloads, contests and comparison shopping with PriceCanada.com. Macworldcanada.ca is owned and operated by ITWorld Canada Inc.
PR: Other World Computing (OWC) has announced its newest OWC Mercury Pro™ Blu-ray/SuperDrive "Quad Interface" External Drive solutions featuring super-fast 8x Blu-ray write speeds of up to 2 GB per minute. The Mercury Pro Blu-ray "Quad Interface" External Drives are the only Blu-ray burners on the market that provide the flexibility of a "Quad Interface" of FireWire 800, FireWire 400, USB 2.0, & eSATA interfaces for Plug & Play compatibility with both Windows and Macintosh systems. Available immediately priced starting at $399.99, the Mercury Pro Blu-ray External Drives are ideal for consumers with large amounts of High-Definition or other video, photos, music, and data files that they want to author, archive, or retrieve using a single disk. With twice the Blu-ray burn speed over earlier Mercury Pro models, the new Mercury Pro Blu-ray External Drives are capable of burning 50 GB of data - equal to 50,000 JPEG images, 17,500 MP3 songs, 25 DVD quality movies, or just under four hours of High Definition video - onto a single disc as quickly as 30 minutes. Additionally, Mercury Pro Blu-ray drives read and/or write virtually all optical media, including DVD-RAM, DVD Dual-Layer R/RW, DVD R/RW, and CD-R/RW, as well as Blu-ray. 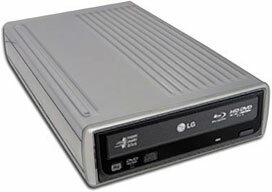 OWC Mercury Pro "Quad Interface" External Drive (Model BDR-203X): $399.99. Writes and reads Blu-ray up to 8x, 16x DVD, and 32x CD Burn Speeds. Includes all connection cables and two 25 GB BD-R discs. OWC Mercury Pro "Quad Interface" External Drive (Model BDR-203XT) with Roxio software: $479.99. Writes and reads Blu-ray up to 8x, 16x DVD, and 32x CD Burn Speeds. Includes all connection cables, two 25 GB BD-R discs, and full retail version of Roxio Toast 10 Titanium. "With Blu-ray write speeds twice as fast as the previous OWC models, as well as the ability to read/write DVDs and CDs, these new OWC Mercury Pro Blu-ray External Drive solutions give anyone with digital entertainment and general data files the ability to dramatically reduce the time and amount of media required to create general use and archive discs," said Larry O'Connor, CEO, OWC. The OWC Mercury Pro Blu-ray "Quad Interface" External Drive solutions have been fully tested for compatibility with most Apple and Windows built-in and third party DVD/CD tools and players, including Apple iTunes, Apple Disc Burner, Apple iDVD 5, Apple DVD Studio Pro, EMC Retrospect Express, NTI DragonBurn, Roxio Toast, Roxio Easy Media Creator, and Nero Burning. PR: Hitachi Global Storage Technologies (Hitachi GST) announced that it has agreed to acquire Fabrik, Inc., a privately-held supplier of personal and professional storage solutions. Fabrik, whose leading storage brands include G-Technology and SimpleTech, strategically positions Hitachi in the fast-growing external storage business. Industry analyst firm IDC expects worldwide personal storage device shipments to grow from approximately 52 million in 2008 to 123 million in 20121. Financial details of the transaction were not disclosed. Closing of the acquisition, which is subject to customary conditions, is expected to occur early in the second quarter of 2009. Fabrik's business will continue intact and form the core of Hitachi GST's newly-formed external storage business. Hitachi GST will fully support the G-Technology and SimpleTech product lines, building upon their success and differentiation in the market. The combined company will also leverage operational, technical and product development resources, distribution channels and global reach to accelerate delivery of a full portfolio of traditional hard drives, solid state drives and branded personal and professional storage products. "The Fabrik acquisition becomes the cornerstone for the next phase of our business transformation. It strategically expands our market presence, strengthens our product portfolio, and increases our customer base," said Steve Milligan, President of Hitachi GST. "Fabrik is a key component of our growth and profit strategy going forward and will enable us to deliver a differentiated set of products across a broad range of enduser market segments." As a 20 year storage veteran, Mike Cordano, Fabrik CEO and cofounder, will join Hitachi GST as a key member of the executive management team. Mr. Cordano has an extensive background in the data storage industry, having previously served as executive vice president of Worldwide Sales and Marketing for Maxtor Corporation. While there, he was instrumental in building the Branded Products Group, which successfully launched the industry's first "OneTouch" external storage and backup solution, which ultimately defined the category and broke the technology barrier for mass consumer adoption. "Hitachi GST provides Fabrik and its customers all the benefits of a vertically integrated company. We gain economies of scale, financial stability, association with a strong brand and a worldwide footprint to accelerate our business growth," said Mike Cordano, Fabrik CEO and cofounder. "We are pleased that Hitachi is building upon our vision and enabling endusers everywhere to enjoy powerful storage solutions that are unequaled when it comes to performance, style, reliability and innovation." Fabrik's leading storage brands include G-Technology, offering premium external storage solutions for the Mac, content creation and professional A/V markets; and SimpleTech, an innovative leader in PC-based external storage and backup solutions. Both brands have clearly differentiated product lines that complement and build upon the existing Hitachi GST hard drive portfolio.